It’s almost Valentine’s Day, which means lovebirds everywhere are gearing up for a day (and night) of romance. But if you’re one of the many people wondering why you don’t have a date this year, the problem may be with where you’re living. 1. 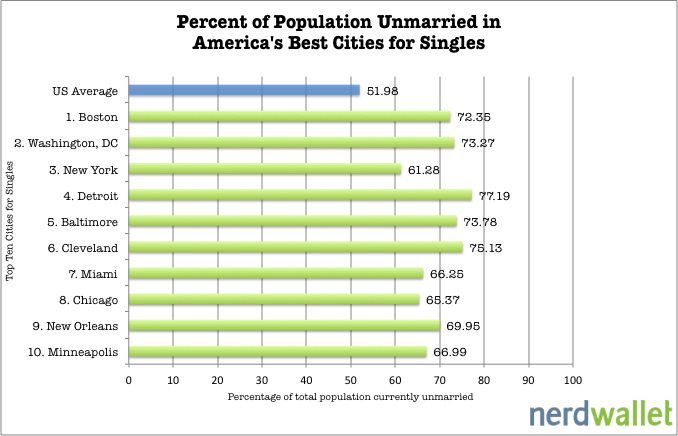 Availability of singles: We looked at the percentage of the population that is unmarried in each of the country’s 50 largest cities. All ten places on this list have a higher percentage of unmarried people than the national average of 52 percent. 2. Ease of meeting people: We assessed the date-friendliness of each city by calculating the number of bars and restaurants per 1,000 residents. 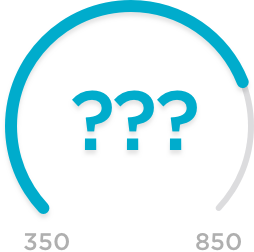 We also used Walk Scores to evaluate how easy it is to live in each city without a car. A city with many venues you can get to without needing a car makes it easier to meet others. 3. Affordability: To see how affordable dating is in each city, we calculated the cost of a pretty darn cheap date: two movie tickets, a 12-inch Pizza Hut pizza and one 1.5-liter bottle of Livingston Cellars or Gallo Chablis or chenin blanc wine. We also included unemployment rates in this category—if there’s a higher percentage of employed singles available, dates will be more affordable. Boston doesn’t have as many bars and restaurants as some of the other cities on this list, but all that it does offer is very much accessible to its residents—the city has the third-highest Walk Score in the country. The cost of our cheap date is lower in Boston than in any other city on this list, at just $31. And as one of America’s oldest major cities, Beantown has a rich history and a vibrant culture, with many theaters and museums that are perfect for a date. The nation’s capital has the fourth-highest percentage of unmarried residents—73 percent—among the 50 largest metro areas in the country. The region has a high cost of living but a very low unemployment rate. Singles, particularly those who enjoy the arts, would find D.C. to be a great place to live. New York City is America’s largest metro area and one of the world’s most iconic locales—and its is also one of the best cities in the country for singles. Although its percentage of unmarried residents (61 percent) is the lowest on this list, NYC ranks so well because it’s home to by far the highest number of bars and restaurants per 1,000 residents and is the most walkable city in the nation. Detroit’s place on this list is boosted by the highest percentage of unmarried residents among the cities examined—with 77.9 percent of folks not having a ring on it. Motown’s cost of a date is the second-lowest of all cities, and although the local economy isn’t great, things seem to be improving—the unemployment rate has fallen over the last couple months. Nearly 74 percent of Baltimore residents are unmarried, and the city scores relatively better than average in walkability and affordability. Like seafood? Then you’ll love many of the restaurants in this port city. Cleveland has the second-highest percentage of singles—over 75 percent—of all the cities we looked at. It also scores well in walkability and date-affordability. Miami boasts a strong Walk Score to go with its enviable weather and location on the water. Beaches, restaurants and a plethora of bars and restaurants make Miami one of the most fun cities in the country for singles. The Windy City has the second-highest number of bars and restaurants per 1,000 people, so singles have a variety of places to meet and/or go on dates. Another reason Chicago is a great place for singles? It’s one of the few cities in the country to have a team in each of the four major pro sports leagues (NFL, MLB, NBA and NHL). Nearly 70 percent of the population in New Orleans is unmarried. Although the city is the smallest of those on this list, it ranks well in affordability thanks to its relatively low cost of a date and unemployment rate. Singles can enjoy the unique culture here, whether it’s Bourbon Street’s nightlife or the distinct Cajun and Creole cuisine. Minneapolis is one of the smallest cities on this list, but the City of Lakes also boasts one of the lowest unemployment rates thanks a strong local economy. Minneapolis is also a great location for arts and culture—the region is ranked second in the nation in live theater per capita—so locals can easily enjoy a nice date at a playhouse. Number of bars and restaurants per 1,000 residents from the Yellow Pages. Each of the three categories – availability of singles, ease of meeting people and affordability – was weighted equally. Check out the Best Cities for Single Women and Best Cities for Single Men as well. Young couple dating image from Shutterstock.